Is Pool Corporation (NASDAQ:POOL) a safe investment now? Prominent investors are actually taking an optimistic view. 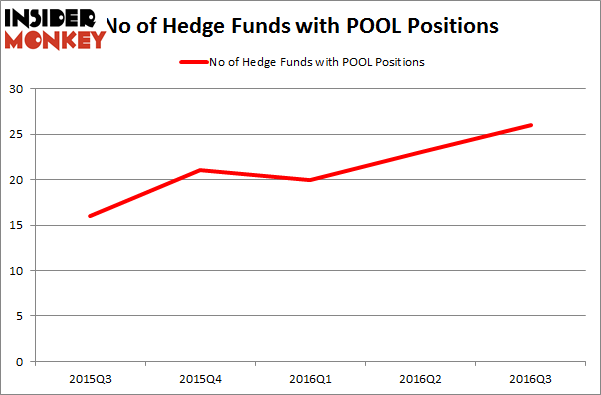 The number of long hedge fund positions inched up by 3 lately. The level and the change in hedge fund popularity aren’t the only variables you need to analyze to decipher hedge funds’ perspectives. A stock may witness a boost in popularity but it may still be less popular than similarly priced stocks. That’s why at the end of this article we will examine companies such as Cullen/Frost Bankers, Inc. (NYSE:CFR), Navient Corp (NASDAQ:NAVI), and Neurocrine Biosciences, Inc. (NASDAQ:NBIX) to gather more data points. With all of this in mind, let’s take a peek at the key action encompassing Pool Corporation (NASDAQ:POOL). How are hedge funds trading Pool Corporation (NASDAQ:POOL)? At Q3’s end, a total of 26 of the hedge funds tracked by Insider Monkey held long positions in this stock, a change of 13% from the second quarter of 2016. This is also the highest level achieved by the company over the last 5 quarters. According to Insider Monkey’s hedge fund database, Ken Fisher’s Fisher Asset Management has the largest position in Pool Corporation (NASDAQ:POOL), worth close to $61.7 million, corresponding to 0.1% of its total 13F portfolio. Sitting at the No. 2 spot is Chuck Royce of Royce & Associates, with a $33.7 million position; the fund has 0.2% of its 13F portfolio invested in the stock. Some other peers that hold long positions comprise Ben Gambill’s Tiger Eye Capital, Israel Englander’s Millennium Management and Ian Simm’s Impax Asset Management. We should note that Impax Asset Management is one of the 100 best performing hedge funds in our database. Gigamon Inc (GIMO): Are Hedge Funds Right About This Stock? Hedge Funds Are Buying Ironwood Pharmaceuticals, Inc. (IRWD) Hedge Funds Are Bearing With Fortress Investment Group LLC (FIG) Have Hedge Funds Uncovered A Hidden Gem in Gogo Inc (GOGO)? PixarBio Corp (PXRB), Bullied Down But Far From Out FCB Financial Holdings Inc (FCB): Are Hedge Funds Right About This Stock?